Being overweight is not the end of the world. Starting a walking program is a great step to take in improving your health and making yourself feel better in more ways than one. Walking is a great and healthy activity, that can give you many health benefits you may not even be aware of. Walking may be a moderate activity that is quite easy for most people. But, for those who are overweight, it can put quite a bit of stress on your body. And for that very simple reason, I am sure you agree, finding the best walking shoes for overweight women is really important. You’ve made the decision to start getting healthier in your life, now you need to pick the best running shoe that will give you a comfortable fit, great support, and keep your feet happy. Walking in your new running shoes, and getting fitter and stronger everyday is a great first step. Here’s to many more! Check out the rest of my page to find the best footwear for yourself, fast! Walking for just 30 minutes a day, releases endorphins, which boosts your overall mood. You know that great “I can do anything” feeling? Yep that’s the one. And you can enjoy it every day, by simply taking up the habit of walking daily. You will find your blood pressure and cholesterol levels dropping dramatically as well. In combination with a diet that creates a small caloric deficit, you will most likely find your weight dropping as well. Just ask the Mayo clinic. With all the research they have done on this matter, it’s safe to assume that they know their stuff! This shoe is targeted for women looking for a neutral and premium daily walking or training shoe, which provides a reliable and stable walk that offers plenty of cushioning. With the updated midsole and the new upper design, the shoe is lighter than it previously was, but it still gives you the cushioning that you really need if you are an overweight woman. It offers a responsive and secure fit. It will give you a comfortable and smooth transition from one step to the next. They will be able to handle your weight across various kinds of terrains. The upper features the FluidFit technology, that comes with seamless overlays wrapping, and a new mesh material. This combination allows the shoe to be much lighter. For those of you who want a durable performance as well as a plush walk, this would be an interesting shoe to look at. The heel is supported by a plastic cage, which is pretty light so that it doesn’t add extra weight to the shoe. The sockliner is made of a bouncy, light material. The gel padding cushions the outside of the toes. It is built specifically for women that demand a high performance of themselves. What makes the ASICS Women’s GEL-Kayano 22 Running Shoe suitable for overweight women is the superb comfort it has to offer, in combination with a snug fit. It is supportive, yet not too heavy or bulky. The shoe applies the updated FluidFit technology for a glove-like fit and enhanced comfort. It was designed to make your steps connect as perfectly as possible. The upper’s breathability has been improved with respect to earlier versions. The forefoot has also been updated from the previous versions, to provide you with even more flexibility. The new external heel counter offers a more secure wrap with increased rearfoot comfort. The Fluid Ride midsole provides the underfoot with an excellent cushioned feel, designed to speed up your gait. The ASICS Women’s GEL-Kayano 22 Running Shoe is an all rounder. It has plenty of support and cushioning, while still being lightweight for those effortless daily walks. The GT-2000 is designed for the woman who wants a walking shoe that is light, with a smooth ride and superb cushioning. The open mesh on the upper allows air to move into the shoe freely, making the internal environment dry and well-ventilated. There is also a heel clutching system that allows you to have a more secure fit, since it holds the rear of the foot firmly in place. The GEL cushioning system provides shock absorption in the landing phase of the heel areas. It’s a rubber outsole, so you can rest assured that it will last you for a long time. Similar to other Asics shoes, the midsole is light, adding to the overall walking comfort of it. The ASICS Women’s GT-2000 4 is a daily running and walking shoe. It is preferred by many runners due to its dependable durability and comfortable cushioning and a very breathable upper. It is a solid and a reliable choice for women that would like to lose some weight. If you are looking for best walking shoes for obese walkers, the ASICS Women’s GEL Evate 3 Running Shoe should be on top of your list. The comfortable fit of this shoe is something that will leave you overcome with joy. Not only is this shoe highly functional, its color and styling is also very impressive. It has the ComforDry sockliner, to make sure that your feet will remain cool and dry, mile after mile. The shoe also features a rearfoot and forefoot cushioning that offers you a smoother transition on various surfaces. The FluidRide midsole offers the perfect combination of cushioning and bounce back. The vertical flex groove has been designed in such a way that it enhances your gait efficiency. And then there is the guidance trusstic system for extra midfoot structural integrity. The gel cushioning attenuates shocks and provides smooth step to step transitions. Neutral pronators and underpronators who want a shoe with plenty of cushioning, are going to be pleasantly surprised by this shoe. If you are looking for a neutral, everyday walking shoe that offers great cushioning, then the Gel Cumulus shoe is ideal for you. With sufficient cushioning and plenty of good support, this shoe will provide you with blissful comfort, one mile after another. The shoe features plenty of gel padding, cushioning and an upper material that is made of breathable mesh to provide maximum breathability. The inclusion of FluidRide midsole provides shock absorption and a good amount of comfortable support. On top of that, the seam normally found on the inside of the toe, has been removed. This gives the shoe the fit of your favorite pair of socks. If you prefer your own, third party orthotics, then rest assured that the shoe has room for those. The toe box is roomy enough to allow movement of toes, thereby decreasing the chance of developing painful blisters. The memory foam padded interior provides proper support to your foot, whether you are walking or running. The rubber traction offers great traction, while the heel counter provides stability and prevents overpronation. Skechers combines sporty comfort and fun fashion in the Women’s Loving Life sneaker. The shoe was designed for convenience. These lightweight shoes feature a mesh fabric, a synthetic leather upper and a generously padded footbed for additional comfort. This is a super comfortable shoe featuring memory foam materials that follow the shape of your feet. This is what gives you that all day maximum comfort. With a slip-on design and a breathable fabric, your feet will remain cool and fresh all day long. The shoes are available in both multi-coloured and solid designs, so that you can get them for either your work environment, or your personal, playful style. The flex groove outsole fitted on these shoes is slip resistant, thereby ensuring that you can walk comfortably, in varying weather conditions. Add a dose of fun to your daily life, with these amazing shoes from Skechers. It is not that easy to find stylish shoes for overweight women that are functional, supportive and stylish. But the Go Walk 3 is easy to slip on, provides sufficient arch support, and allows you to show off your sense of fashion. These are the ideal walking shoes for women who want to both feel and look good walking. The upper material features a breathable mesh surface. With this feature, you can be able to wear very thin socks, while allowing your feet to breathe comfortably. The socklining has anti-microbial properties for preventing foot odor. The heel cushion has been crafted inside the insole. This implies that no additional insoles are required, for those with high arches. With this high cushioning, you are able to increase your walking time without feeling tired. The outsole, made with Goga Pillars technology, provides traction. This is another popular and highly rated shoe for obese walkers. One of the main features of this walking shoe is that it is available in different designs, styles, and colors. They are perfectly crafted, featuring an insole that has been adequately cushioned for comfort. The midsole has been designed to absorb shocks when walking. This feature helps to spread the weight evenly, for women who carry a few extra pounds. A durable heel ensures that the foot remains firmly in place. The mesh and trubuck upper comes with a lace-up front and overlay detail. The cushioned insole and the rubber traction sole, ensure that your movement is steady and stable. The D’Lites live up to their name, giving you delightful style and comfort, whereever you go. The Shape Ups are listed among the best walking sneakers for the money, due to a wide range of reasons. If you like Skechers, want leather and you like sneakers, then the Shape ups provide you with the perfect combination. If you are looking for walking shoes with a sporty look, then these shoes offer you a great selection. They are designed for women who want to lose weight, keep fit and burn calories. The strength and fitness model is just the perfect combination for overweight women. It is an excellent pair of shoes, that do not wear out easily. The outsole is made of durable rubber. It is designed to provide maximum support while ensuring stability and traction. The shoes are true to size, and don’t need to be broken in. If you have been suffering from foot pain, these are the ideal shoes for you. Although they will provide significant benefits when used for walking, they are also ideal for those looking to tone up the hips, legs and thighs. This is a simple and cute sneaker style, which takes you back to the classics. The ankle collar comes with comfort features together with a footbed designed for daily wear. The shoe is made of synthetic materials and high quality leather, making them easy to clean and highly durable. The internal part of the shoe is smooth and even, devoid of uneven spots that might cause you hindrance as you take a stroll. Considering the fact that these are slip-on shoes, they have been fitted with handy elastic towards the front panel for easy slipping on and off. The soles have been crafted using top grade rubber, which is heavy duty and durable. It offers great traction, meaning you don’t have to worry about slipping or tripping when walking on wet surfaces. These shoes provide you with the ultimate in comfort, thanks to the EVA comfort insole. The EVA midsole contains lots of cushioning and padding, thereby giving you excellent shock absorption with every step you take. The Ride 7 is one of the best shoes for women looking for a comfortable shoe, thanks to the extra plush cushioning and the fact that it is lightweight. The shoe features PowerGrid EVA foam from toe to heel. The flexible outsole combined with the single cushioning layer, will give you a smooth walk on different kinds of surfaces. If you are a forefoot striker, than you will definitely appreciate the plus forefoot and the more flexible midsole. The outsole is durable and comes with rubber segments, especially on the high impact areas. This increases its durability. It is designed to accommodate neutral walkers, while maintaining resiliency and integrity. Just like its predecessors, the shoe has maintained the traditional combination of welded-on overlays with dual density mesh. A heel collar and tongue, together with reinforced eyelets and flat laces, provides a secure and soft fit. A durable rand extending round the toe box, offers additional support. Updated from Kinvara 2, this shoe features a more durable outsole with an updated material and construction in the upper. The outsole has been fitted with reinforced rubber, especially on the high impact areas. With these additions, the outsole will not wear out so easily. The open mesh on the upper ensures that the shoe is more breathable, adding to the overall comfort of the shoe. The thin film overlays welded on the upper, commonly known as FlexFilm, secures the feet snugly. The Rundry collar lining provides moisture wicking, so that there is no accumulation of perspiration inside the shoe. The SSL EVA midsole is durable, responsive and lightweight. On the other hand, the EVERRUN Heel Insert helps in returning energy during heel striking. This shoe is lightweight, and it won’t take long before you’ll never want to part with it ever again. If you are looking for a lightweight, durable and a visually appealing pair of running shoes, then you should choose the Saucony Excursion Tr11. Although it’s marketed as a running shoe, you can use it for various outdoor activities such as training, moderate hiking, walking or even dancing. Just like its previous versions, the Tr11 features an XT-600 rubber, which supplies durable traction. And when you encounter wet or slippery surfaces, the multidirectional lugs on the outsole will dig into the ground, thus preventing you from slipping or sliding. The use of mesh construction on the upper part of these shoes makes sure that your feet have sufficient ventilation, thus keeping your feet dry and fresh at all times. You can use these shoes even during wet conditions, thanks to the inclusion of Gore-Tex membrane on the upper. Comfort remains a key feature of these running shoes, thanks to the cushy midsole. The midsole is equipped with IMEVA cushioning, which is equally distributed along the length of the shoes. As a result, your steps will be softer, and you will not experience painful joints, even after a whole day of rigorous training. Also, the use of Injection Molded EVA (IMEVA) enhances the durability and responsiveness of the midsoles. These shoes are further equipped with an exclusive technology known as Heel Grid System, which delivers additional shock and impact absorption. Saucony Triumph 11 is a lightweight pair of running shoes, which delivers a great blend of cushioning, protection and comfort. It features a low profile design, which makes it not just a great running shoe but also a versatile everyday training shoe. Its outsole features a combination of XT-900 carbon rubber and Saucony’s proprietary rubber iBR+. Saucony uses iBR+ in its line of running shoes to add cushioning and an extra amount of traction. Since iBR+ is stickier than ordinary rubber, it delivers great traction, especially on wet surfaces. On the other hand, the XT-900 rubber provides durability. It has been placed around the high abrasion areas to prevent premature wear and tear. For the midsole, Saucony has utilized its exclusive Power Grid technology, which supplies responsiveness as well as stability from heel to toe. Also, the midsole works to disperse underground impact when the foot strikes the ground, therefore cushioning your feet in the process. When you wear these shoes for the very first time, you will immediately experience a different level of comfort. The company has incorporated Sauc-Fit technology on the upper part of these shoes, which gives them structure while wrapping around your feet comfortably. Saucony Triumph 11 has also used a HydrMax collar lining, which wicks away moisture while preventing unnecessary rubbing and blisters. The Brooks Addiction Walker has revolutionized walking footwear. It has the feel and fit of a running shoe, but it is specifically designed for walkers. It features motion control for limiting overpronation, or any other type of excessive sideward movement for that matter. A certain amount of corrective support and stability is provided by this walking shoe. This secures the foot firmly in place. At the same time, it ensures that the foot does not turn inward, which can often lead to knee pain. The shoe features a MOGO midsole cushioning, that works well in reducing shocks. As a matter of fact, the MOGO midsole has won an award for the excellent cushioning that it offers. The sole is slip resistant, allowing you to go for walks even on slippery surfaces. Snowy or rainy weather will not pose a problem to these shoes. The full-grain leather upper, the MOGO midsole cushioning and the slip-resistant outsole, make this the ideal walking shoe for overweight women. The Brooks tradition of offering a smooth walk and premium cushioning, is continued in the Glycerin 13. The element mesh on the upper helps to manage moisture, ensuring that the shoe remains breathable. The synthetic overlays offer a secure and seamless fit. On the other hand, the element linings and the sockliner offer a cool inner environment and contoured support. The DNA midsole follows the shape of the foot on the underside, ensuring that the shoe fits the wearer as well as if it had been customly made. The caterpillar crash pad offers stability. The outsole has been made in such a way that it offers pressure distribution, flexibility, durability and traction. It is a durable, comfortable and sleek walking shoe. It offers good mechanics and moderate stability for daily support and comfort. This shoe is designed for the neutral walkers and/or runner. The seamless, 3D Fit Print uppers feature thin synthetic overlays. Thanks to the moisture managing, your feet are sure to remain dry, cool and fresh in these Launch 3s. They also come with a lace-up closure for a secure fit. For added comfort, there is a lightly padded tongue and collar. And don’t forget about the soft fabric lining, ofcourse. The insole, made from foam, is removable. So if you want to customize the support you’ll get from these shoes, you can simply insert your own orthotics. The BioMoGo DNA midsole provides adaptive and dynamic cushioning, while a segemented crash pad on the heel absorbs impact shock. The Transcend 2 is a blend between guidance and control. Instead of using the dual-density midsole, the shoe has been crafted using single density foam. The upper features mesh, which gives you moisture management and a breathable experience. Microfiber and synthetic overlays secure the foot in an efficient manner. The super DNA sockliner, together with the element lining, provide a comfortable internal environment for your feet. The shoe was made in such a way that it conforms to the natural shape of your feet. It will make you feel in sync with the shoe. The outsole provides a reliable and efficient amount of traction on various kinds of surfaces. The New Balance Women’s 990V3 is an iconic shoe that mixes a really great design together with excellent cushioning and foot support. Especially so that you can walk not only in comfort, but also in style! In terms of aesthetics, this shoe is very appealing. The heel design certainly stands out. The shoe features a blown rubber forefoot together with and ABZORB midsole and a dual density collar. It all comes together to give you excellent stability. Whether you are ascending or descending hilly paths, you will move with ease. The sole bends easily and is flexible enough to contour to your feet. The shoe also comes with ENCAP midsole cushioning, to ensure that your mid-stride motions are always comfortable. The upper is made of a mix of mesh and leather. This reduces the weight of the shoe considerably, while also allowing good breathability, now matter how long you wear it. The design is flexible and supportive and the shoe fits straight out of the box. It is incredibly comfortable and remains one of the best walking shoes for overweight women. 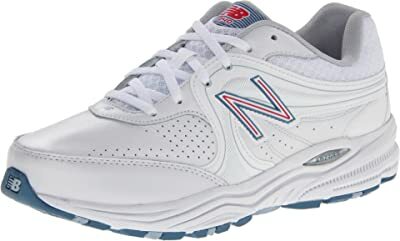 The New Balance Women’s WW847V2 is a Medicare approved shoe for overweight women. It is designed to ensure maximum motion control together with all-day comfort. This fitness walking shoe comes with breathable mesh, a synthetic upper and the Lightning Dry lining. These features, combined with an ortholite foam, help to manage moisture and odor. An Ndurance rubber outsole makes sure that you have sufficient traction and support, wherever your walk may take you. The lacing system comes with plenty of eyelets for a flexible and adjustable fit. The ortholite foam insert makes sure that your feet have ample cushioning, while the Rollbar stability feature gives the shoe balance and great stability. A foam collar on the internal lining in combination with the padded tongue provide extra cushioning and a snug fit. The New Balance W990v4 features a great choice for women looking for performance training shoes. It provides superior midfoot stability, exceptional comfort as well as durable protection. Mesh fabric covers its entire upper. This material has not been woven closely as it was the case with previous iterations, thus giving you a breathable and comfortable wearing experience. Pigskin leather has then been laid over the mesh to add durability. Its tongue features a lace keeper, where the laces can loop into when you adjust them. The inclusion of a lace keeper in this new design ensures the tongue remains in position. As much as New Balance has used ENCAP midsole technology like the previous versions, it has reconfigured the entire midsole unit to ensure increased medial mid-foot support and reduced overpronation. The combination of polyurethane and EVA in the midsole enhances the durability of these shoes while preventing premature wear and tear. Therefore, once you purchase these shoes, you are assured of high levels of performance for a long period. As expected, New Balance has utilized Blown Rubber in the outsole, resulting in responsiveness and durable traction. With the New Balance W990v4, you can train during spring, summer or winter, and you never have to worry about your feet anymore. The New Balance Women’s W1540V2 Running Shoe provides ultimate motion control and rearfoot stability to overpronators. The overlays in the upper makes the shoe appear more open, and more breathable. These overlays are much narrower and thinner than those of its predecessor, the 1540V1, exposing the breathable mesh more. Despite the reduced bulkiness, support is not compromised in the slightest. The sturdy stitched-on overlays wrap the midfoot perfectly, forcing your feet in their proper position as you run or walk. The Rollbar in the midfoot has been flattened out to offer more gradual motion control. However, despite the changes that have been applied to this version 2 shoe, it retains its core feature of giving you excellent motion control, preventing your foot from rolling outwards or inwards. This makes it one of the best walking shoes for people with biomechanical issues such as high or low arches. The arch support is highly improved in this shoe. The toe box is roomy, to accommodate women with wider feet. This is among the top walking shoes money can buy. Combining stability and support, the New Balance Women’s WW840 athletic shoe endures the rigors of high intensity walking or running with a padded collar, a full-grain leather upper and a herringbone pattern carved in its abrasion resistant rubber outsole. The ABZORB technology energizes the shoe and disperses shocks evenly, regardless of the surface you are walking on. It also features a mesh lining to ensure breathability. This keeps your feet cool and dry, even during intense summer temperatures. This shoe fits the foot like a glove. You don’t even require a break-in period. You remove it from the box, slip it on and go right ahead and take that morning jog or walk. The Absorb midsole provides superior cushioning as well as flexibility, that work well together to support your natural gait. The toe box area has enough room for your toes. The heel area has a slightly closer fit. On top of that, the insole is removable. This can come in handy in case you want to use other types of insoles, such as these Tread Labs Strides. With the reliable shock absorption and comfort offered by this shoe, you can walk the extra mile. Quite literally! How To Find The Best Walking Shoes For Obese Women? What Kind Of Shoes Should I Be Looking For? When you are an obese woman, you will need to get the best shoes designed for walking that you can get for the money. The most essential features that you need to be searching for, are stability and cushioning. When you have shoes with good cushioning, then this will add lots of stability to your foot. It’s important that you strike your walking surface evenly, no matter what your walking surface may be. A lot of walking shoes out there have been designed to be light and flexible. But sometimes they lack cushioning support. This is important to have, since it will protect your feet and your joints. If you are maybe planning on walkign in order to lose some weight, then you would do well to avoid the less supportive models. Flat models are also no good for women with a few pounds extra, since flat shoes are designed for people at ideal weight. You can also decide to go for running shoes. These always come with good cushioning as well as stability. Where Do I Buy These Shoes For Women With Excess Body Weight And Wide Feet? If you are dead serious about finding the best shoes for yourself, then you can measure your arch as well as your gait. There are plenty of shoe stores and sports stores that have the equipment in order to do that. Walk into whichever store you like best and ask the salesmen there to measure your feet. You need to know your size, gait and arch. If you are not ordering online, like most people do nowadays, then you can also simply go to an old fashioned physical store and try out a pair of shoes. The upside to buying from brick & mortar stores, is that you get to try on the shoes that you are eyeing. However, you can save big by buying online. What Is The Best Walking Footwear For Women Who Are Struggling With Their Weight, Bad Knees And Lower Back Pain? When you are wearing shoes that do not fit comfortably, then you are going to have a bad time. When you are overweight, you are more likely to suffer from discomfort when wearing shoes all day long. Thankfully, there are plenty of different shoes on the market that can help plus sized women be more comfortable during the day. In the rest of this post, I will compare a few different kinds of shoes. I will group them by type for your convenience. When you are carrying excess weight with you, there is a chance that you are overpronating. This is usually due to fallen arches, which are also known as flat feet. Sometimes people call them low arches as well. If you are after dress shoes, then you could buy Superfeet insoles for overpronation. But it all depends on the severity of your condition. These are some of the best walking shoes out there. If you are looking for a shoe with a pretty generous fit, then you can easily wear this all day and be comfortable too. These shoes are very well suited for working environments. However, the Crocs design is also suited for wearing casually. Brooks is a great brand for getting running shoes from. If you’re feeling sporty and want to do something about your weight, these would be a great start. These running shoes will give you a very decent level of stability and cushioning. They are pretty light weight as well. They are highly recommended for normal feet. You can get these in either normal, narrow or wide foot size. They are easily the most comfortable in the whole Brooks range of running shoes. You can alleviate pain using these shoes. Many women are of the opinion that they are very comfortable for running. You can also take long walks in these. 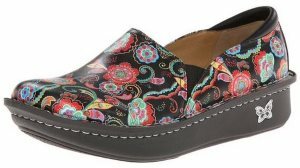 These shoes are ideal for women who are carrying around an extra pound or two, who are finding themselve having to stand up all day long because of work. You can get these in a wide size as well. You will do your lower back and your knees a great favor by getting these when you are putting in long hours. The OSHA compliant slip resistant outsole makes this a great shoe for wearing in slippery working conditions, such as a kitchen or a restaurant. Another great walking shoe for plus sized women. You have three levels of cushioning and a Velcro closure in these shoes. It’s the type of quality you can expect from Dr. Scholls. You can get these shoes in extra wide size and even half size. No matter what foot size you have, you will be able to get a pair that fits perfectly. They also come with ankle cups, which will provide you with additional comfort. Really great shoes to wear when you are suffering from pain in your lower back, or if your knees are going bad. 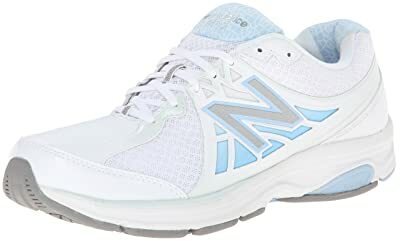 When you’re looking for the best of the best when it comes to shoes for walking for obese women, then New Balance is a good deal for you. The W1540 model is a really good one because of the extra cushioning. This will help you prevent lots of injuries that would have held you back for weeks. If you are suffering from obesity, then you are more prone to all sorts of foot related injuries, such as ankle twists. You will have optimal fit and support because of the technology that these shoes are built with. You can expect to have stable ankles and feet while taking a walk. The Elise model is great for women who are a plus size, who are looking for a sporty, fun and stylish sneaker. These shoes are ideal for wearing casually or for wearing while going for a run. You can get the Elise model in lots of colors and finishes. These are very suitable for people with problematic feet. For this reason, they are very popular. In case you are carrying around excess body weight, these are the shoes for you. But they are not just for women who are a tad bit on the heavy side. You can also be suffering from fallen arches, high arches, over pronation, over supination or you may have a diabetic foot. In that case, this shoe is also very good for you. They have been Medicare approved for diabetics, thanks to their stability and cushioning support. They also have a very good arch support. When you take a look at the toe section, you will see that it is deep and wide. You can also remove the foot bed, so that you can swap it with orthopedic insoles if this is what you prefer. The outsoles are slip resistant for extra stability. They are also odor resistant, which is something that is becoming more popular these days. If you are suffering from lower back pain, these shoes can also greatly help you out. Highly recommended for women with bad knees and pain their lower backs. These shoes have been designed with a very specific purpose in mind. Name to help out those who are suffering from plantar fasciitis or other kinds of foot health problems. They come with a removable inner sole. This will make you feel so incredibly comfortable that you’ll think you are walking around on clouds. You’ll literally be on cloud 9! These shoes are very suitable for overweight ladies that also suffer from fallen arches. You can avoid or treat low arches using these Springboosts. These shoes have a ramped up arch that offers great support. You also get some additional padding to ensure that every step you take is comfortable. It comes with a lower heel to help you maintaining good posture while you are taking a walk. These shoes have great shock absorption beans in the shoe sole. These will help you get a more effective workout more easily. New Balance’s WW847 model is another great model in the New Balance line of foot health shoes. Are you suffering from flat feet or wide feet? Do you have high arches? Are you over pronating or over supinating? Are you also overweight? Then this is just another great option for you. Like with other models, insoles can be swapped. So if the standard manufacturer’s insoles are no good, you can get a pair of your own. Brooks’ Addiction model is a great shoe for when you are walking or running around in rainy weather. It has a slip resistant outsole. Brooks is well known for making great shoes that provide good foot support for people who are dealing with problems. It has a so called Mogo midsole, which gives you unmatched shock absorption as well as cushioning support. They really have the feel of running shoes as well. Are you suffering from low, fallen arches? Do you have flat feet? Then this slip resistant shoe is a good one for you, if you care about your foot health at all. You can get these shoes in extra narrow and extra wide sizes. You can also choose between three different colors. The Addiction Walkers by Brooks are also good for people who not only have flat feet, but also have a moderate to severe case of over pronation. One trend I have recently noticed, is that tennis is becoming more and more popular these days. I can imagine why, because I’ve tried it myself recently and had a lot more fun doing it than I thought I would. But I stray… If you are a tennis player, be it an amateur newbie one or a veteran professional one, and you also happen to have been cursed with flat feet (courtesy of mother nature), then you are going to want to find the best women’s tennis shoes for flat feet that you can (and for guys I have this top men’s tennis shoes for low arches page). If you’ve lost enough weight that you can now move on from walking to playing tennis, then I take my hat off to you, because you’ve obviously accomplished a great milestone in your life. No doubt you are starting to feel a lot better about yourself. And all I can say about that is, by all means… keep the trend going. You can achieve so much more. Moving up on the sportivity activity ladder is a very satisfying, gratifying feeling. Tennis is an absolutely fantastic way of taking your physical prowess to the next level. But if you are still a bit overweight, and maybe if you’ve got flat feet too, then you will definitely need tennis shoes that give you good support. This will give you the biggest chances of seeing it through and achieving even more success! So when you have flat feet, then you will need shoes that give your low arches support. The more intense the activity, the more important it becomes that you get that much needed support. A flat footed athlete is almost always an over pronator. This can lead to many problems in the long run. A good tennis shoe for low arches is going to help you out tremendously. You might also want to consider getting custom orthotic inserts in order to get the most benefit from your new footwear. I have done some research on the web and compiled a handy dandy top 10 list for your convenience. I will come back later and update this page with pretty pictures! Many years ago, I used to be pretty overweight myself. Every single time I was either walking or running, it felt like I was drilling my shins into the ground. My being overweight has caused some serious damage to my knees early on in my life. I had no intention of letting that problem escalate as I grew older. While losing weight is always a good idea when you are overweight, firstly you can make sure that you are wearing the right shoes. The health of your feet is at stake and you do not want to let starting problems grow out of hand. So if you are a fellow overweight person, then you will want to keep reading for sure. To start with… you are going to require footwear that gives you the support you need. You need shoes that will support your bad knees and that will prevent lower back pain. The $10 sneakers that you can get from your local Wal-Mart are not going to be sufficient. Not in the slightest. If you are too heavy, you’re going to have all sorts of problems related to your posture. Especially your feet. Do not make this problem worse by skimping on the footwear. Either visit a sports store in your town or go online and research the right kind of footwear for heavy people. At a store, a salesman will be able to test your feet. They can tell you what your right size is. But they will also be able to advise you on the best kind support for you personally. I don’t know about you, but my feet are pretty flat. Not completely. But my arch is very low. When you get yourself a default pair of running shoes from any average store shelf, then you are getting a pair of shoes that assume a decent (average) arch. That’s going to end up giving you cramp, big time. I once went to a shoe store to have a face to face talk with an actual shoe salesman, and he did a foot blot test in order to help me find the best pair of walking shoes for me. In the foot blot test, the bottom of your feet are made wet and then you simply stand on top of a dry piece of paper. This way, you will be able to see how flat (or not) your feet are. Luckily, most shoe manufacturers have all sorts of variations depending on the arch of your feet. You can also get orthopedic supports which will further help you get decent support for your own unique feet. These are not your average supports that you can get for pennies on the dime at the dollar aisle in your local convenience store. I’m talking about the kind of supports that have been molded to your feet, so they have been specially fitted for you. If you have had problems with finding well fitting, snug shoes in the past, and you haven’t tried this yet… then it looks like you still have an open option available to you. You have also got to check the width of the shoes you are looking to buy. If you are overweight, then it’s pretty likely that you also have fat feet. Some people have wide feet to begin with. When you grow obese, this problem only becomes worse. Whether your feet are wide through genetics or obesity (or a combination of both), you will never want to cram your feet into shoes that are too tight. You also have to make sure that your shoes will be able to tighten up over time. Because let’s say that you lose a lot of weight because you’re doing a lot of walking or running in your new shoes… then your feet might start becoming narrower. You don’t want to have to go out and buy a new pair of shoes already! Most people lose weight in their hands and feet, before they lose it around their hips (women) or waist (men). When lacing your shoes, you have to make sure that you’ve laced them exactly right. When you are wearing shoes with a good fit, then they will not squeeze your feet so tight that they go numb after a few minutes. But then again, they should also not slide off with every step you take. When running, your feet could very well swell a bit. In some people (such as me), feet swell pretty much all by themselves and are bigger at the end of the day. Running is already pretty hard as it is. You don’t want to have your feet go numb all the way down from your ankles after you’ve had a jog. If you ever experience the tingling sensation from a ‘sleeping foot’ when you take off your shoes, that’s not a good sign. Another thing to keep in mind, is that you need to check for how many miles your shoes will last, if possible. When it comes to footwear, it’s kind of just like with your car tires. The more miles you put on those babies, the worse their performance is going to get. When jogging, you are putting quite a lot of repeated stress on your shoes. They will wear out some day, no matter how high quality they are. The rubber from the soles will slowly wear away. The supports are going to totally break down at some point. At this point, your chances of hurting yourself are going to increase. You will either get bad knees, lower back pain, or both. Let’s say you are keeping a mileage log. Or better yet… just keep a mileage log already. Because you have to know when to buy your next pair of walking shoes. Your log doesn’t have to be accurate down to a single inch. But it’s great to keep a weekly estimate of miles travelled in your shoes. Continuing to walk or run on worn out running shoes is a great way to develop all sorts of nasty foot problems, such as plantar fasciitis, ankle injuries, sore knee joints, stressed calve muscles, etc. Walking and running are hardly the most expensive sports out there, so you would do well to not be a cheap skate when it comes to buying walking or running footwear. I hope that the information I have supplied above will help you in your quest to find the perfect shoe for you. I am updating the Boot Bomb’s pages all the time, so you might want to check back here later on to see if there is more useful information available. I love writing about healthy walking, jogging, running and hiking habits! If you are overweight like I used to be, then please remember… there is a healthy person inside of you, simply dying to get out. Starting out with good shoes would be a great start to a new you! You’re just going to have to get your behind in gear to find the healthy person inside of you! Sometimes, you’ve just got to have rubber on your feet. If you are searching for the best rated rubber shoes for walking all day long, chances are you are doing so because your job demands that you have to be up on your feet all day. And you’re just looking for something practical. But you don’t necessarily have to have a demanding occupation to enjoy walking around on rubber shoes all day long. You can also walk on rubber casually, because it’s just that comfortable and practical. Before you know it, you’ll be taking your nightly walks around the block in your new rubber shoes, because they will allow you to stand up and be on your feet for a long time. Rubber has many advantages over other materials. To start with, it has the habit of stretching and being flexible. Not only is rubber really flexible, but it also stays flexible no matter how long you own the shoe, or no matter how cold or warm it is in your environment. Rubber walking shoes are tear resistant and simply will not break. They also don’t have any seams, which makes it very easy for you to clean them. Are you looking for stylish duck boots that you can wear even during the wettest of days? Well, that pair of shoes is none other than the JBU Gwen rain shoes. These cute and comfortable shoes will keep your feet dry, especially when you dash outside to fetch some groceries during winter. They are easy to slip-on and the materials used are 100% vegan-friendly. And they are so lightweight that you will barely notice you are wearing anything on your feet. The outsoles provide reliable traction, and they don’t track mud. The upper material is flexible, making it easy for people of different sizes to obtain a snug fit. From shopping during the weekend to slushing around as you head to work, these cuties are ready for any weather. They are super comfortable and versatile. Also, these shoes are made of durable materials. Therefore, they will serve you for quite a long period, before they need a replacement. You can wear them with a pair of socks if you want to increase their warmth, especially when the temperatures are below freezing point outside. If you are looking for a pair of comfortable and functional duck shoes that you can wear during the wet season, then you will never regret purchasing the JBU Gwen rain shoes. You don’t have to abandon your stylish side just because it’s raining outside. You can always step out in style, thanks to the Joules Wellibob. You can easily pair these cute boots with jeans, among other outfits in your wardrobe. With a shaft measuring 6.5 inches, these boots will protect your feet and legs against the elements, thus keeping your feet warm and dry. Once you combine them with some waterproof pants and gaiters, you can do whatever task you want, even when there is heavy snow. They come with a soft fur lining, which keeps your feet warm and cushy. Walking in wet conditions can sometimes be risky and dangerous. But with these boots, traction is guaranteed. They deliver a firm grip on the ground, making it easy to walk on different surfaces. The outsole is also sturdy and the overall construction is top quality. A pull-on tab at the rear makes it easy to pull them on and off. You can insert custom orthotics if you need more arch support since they are roomy inside. The Joules Wellibob is a fashionable choice for wearing during the wet days. They are easy to pull on, and you can combine them with different outfits. They are so comfy and cozy that they will make you wish for a rainy day. The Sperry Saltwater is an iconic pair of duck boots, designed for cold weather explorations. With these boots, your feet will remain dry and comfortable, even during torrential rains. They are equipped with a vast array of features and materials, which have been specifically designed for convenience, comfort as well as durability. The interior features a micro-fleece lining, which supplies cozy warmth. On the other hand, the wave-sipping rubber outsole ensures traction, both on wet and dry surfaces. A slightly raised heel improves their stability and balance while giving these shoes a feminine appeal. Pulling them on and off is a breeze, thanks to the side pull-on zipper. And you can always adjust them according to your size and fit, using the sturdy laces. Regardless of where your adventures or your expeditions take you, these duck boots will deliver all-weather comfort. You can use them to spruce up your winter or fall outfits, use them to run errands around the city or use them for gardening. I sincerely hope that these tips and tricks and this shoe comparison for women who are overweight has made it easier on you to find the best walking shoes for yourself, whether it be for running, walking or working. Also, if you are interested in viewing many more high quality shoes that don’t drag you down when going on foot, then please visit my Top 20 Best Lightweight Walking Shoes! And ladies… if you just so happen to have a man who also needs to get his rear into gear in order to stay attractive to you, then by all means… check out my overweight men’s running shoes page, which has recently been updated to include far more running shoes than it previously had! Your hubby will be grateful that you took the effort to help him improve his life! 6 How To Find The Best Walking Shoes For Obese Women? 6.1 What Kind Of Shoes Should I Be Looking For? 6.2 Where Do I Buy These Shoes For Women With Excess Body Weight And Wide Feet? 6.3 What Is The Best Walking Footwear For Women Who Are Struggling With Their Weight, Bad Knees And Lower Back Pain? As an overweight woman who was “hell on heels” even when a normal weight, I have to disagree with all of these recommendations. I destroyed all kinds of top-of-the line running and trail walking shoes. I exploded my jungle combat boots from the inside out. The only things that have held up to my weight and the constant abuse of my feet and ankles are: Army issue standard black combat boots, Steel-toed Wolverine work boots, and a pair of Ariat lace-up roper boots. I haven’t managed to somehow destroy the support in any of those. Maybe it would “help” if I didn’t treat my feet as battering rams, forklifts, earth-movers, rock-kickers and things to be jumped on frequently. But if you really are hard on your shoes, you can either pay to replace them every 60 days and listen to some shoe salesman tell you that five miles a day is “marathon walking”, or you can go for something truly designed to hold up to a lot of abuse. Thanks for taking the time to share your experience with me and my readers! But what about good looking shoes, not athletic shoes for overweight women? You can’t wear athletic shoes with a dress. 🙂 Ankle boots, dress shoes, sandals, there has to a be a brand (s) that are stylish and comfortable for bad knees. You just hit the nail on the head. I am going to expand this page with more types of shoes in the near future. In the meantime, I also have pages up on supportive ankle booties and arch supporting flip flops that I think you will like! I’ve been quite a fan of Ziera shoes. They come in regular to extra wide widths, and they have some cute additions every season. I’m a hairstylist with plantar fasciitis, achilles tendonitis, and a messed up knee, and these shoes have been a HUGE help. They’re a little pricey, but a good pair of shoes will last ya! Might be a little late to comment, but perhaps it could still be helpful! Thanks for sharing. Maybe Melinda will get the tip. If not, then you’ve helped out others with your advice on Zierra. I had never heard of them myself. But I’ve been checking them out. These Espresso Nubucks look like they could help a girl out! Sounds like you’ve got quite a challenge on your hands! Do you think that clogs such as Sanita or Dansko could help you out? They are sturdy and roomy. They are unlikely to press on your toes. Hi Krish, you came to the right place! I have two pages full of standing shoe reviews for you. Here’s one, and here’s the other. Blister question: Do you have any further advice for someone who seems to get blisters at the drop of a hat? Should I also be looking at certain socks as well? I live in the tropics, am overweight and my skin is very sensitive due to allergies/dermatitis. I only need them for walking. Lucky you, living in the tropics. I should come visit sometime! I have found some excellent advice on how to prevent blisters on wikihow. It advizes you to wear good fitting shoes that are properly broken in, in combination with non-cotton socks to reduce friction, and also comfortable insoles. Do you have a Facebook page to follow? Thank you for.taking the time to write this. I felt.like I connected with some of the things mentioned. I have had a hard time finding that perfect shoe for me. I am flat footed, plantar faciitis, horrible knees, back injury and defiantly overweight. When you say how many miles a shoe will last can you also break that down to number of months? I also see that a male “Brian” has responded to a lot of comments so who is the woman that has wrote about the women’s area? Would prefer your reply also goes to the email I provided? Here is the Boot Bomb Facebook page! The number of months that a shoe will last highly depends on its quality and usage frequency. Cheap, low quality shoes can last maybe 3 months with almost no use. But higher priced, higher quality shoes that are properly maintained can sometimes last 10 years or more. There is a team of writers behind Boot Bomb, both male and female. I couldn’t tell you who wrote what exactly, since I’ve got 380.000 words on this site, and counting! I am wondering about extra depth shoes. In addition to the weight load, I have lymphedema, rheumatoid arthritis, and two flat feet that are shaped like a shoebox, so it’s hard to find shoes! Right now the only shoe I can wear are some made by Crocs or PW Minor that are deep enough to accommodate my feet. Would love any info you have. Sorry to hear about the problems you are having with your feet! If you don’t want to wear Crocs anymore, then about Sanita or Dansko? Also, I’ve found some extra depth shoes on Amazon for you! I have fallen arches but my feet seem to roll outward too. My legs and back hurt almost constantly, since my hysterectomy 4 years ago I have steadily gained weight, I need to get back to walking. I am buying new shoes every three months, New Balance Runners, Asics, most recently Brooks. Any suggestions. I have bought all the inserts. Everything I try is great for a few days then I’m right back to hurting, Ill go broke buying new shoes every week!! Sorry to hear you are experiencing such inconvenience. Your situation sounds serious. Have you visited a podiatrist in order to get professional advice? As for insoles, my personal favorites are Tread Labs. As for back pain… I experience it myself sometimes as well. Sometimes, I sit for too long at a time. It gives me lower back pain. Then, when I do these stretch exercises, I get instant relief. I can’t guarantee they’ll work for you as well. But there is no harm in trying! The boots that look most appealing to me are in a photo of a girl walking on pebbles on your web page but not listed. Can you please tell me what brand/style are those shoes? I’d like to know myself, so I can list them! If any of my readers knows, please chime in! I am struggeling with my heals and is overweight, i really would like to start walking, what tekkies would b best. When i walk with heals its so much better, ohter than than i really struggle with alot of pain. Can you explain what you mean by ‘tekkies’ ? If you suffer from heel pain, make sure to get good insoles. I notice you don’t include best walking shoes for obese women with severe underpronation. My latest content update has shoes organized by brands, rather than over pronation severity. I’ve done this because most people buy shoe inserts to fix their pronation issues, anyway. I am trying to find the best shoe to purchase for my dad. He wont go have shoes made or sized, so he is 10.5 – 11.0 with a width of 4E. His ankles are huge and he said he needs some support for them. Any ideas? He is probably in excess of 500 lbs as well. I really want to find something that will work for him as he is still working 9-5 and having to climb stairs at home to get to his bedroom. You’re on the women’s walking shoe page here. If you’re looking for sturdy footwear for the working man, then perhaps you can find some wide boots on my work boot page. Let me know if this helps. If not, just post another comment! I have a few “problems” that I need help finding a shoe for. I know that’s a lot of problems, but was wondering if you had any suggestions. I am to the point that I am willing to pay whatever it takes. #7 is my biggest concern at the moment. I am desperate to fine a shoe that fits well that reduces friction points/helps me not hurt as much. Thanks for taking the time to make this very informative article, and for any help you can provide! Sorry to hear about the many problems you are experiencing. Due to the amount of conditions you have to deal with, it almost makes me think you’d need a boot rather than a shoe. Since you are most concerned about your blisters and ulcers, and you say you have wide feet, it couldn’t hurt to look at Dr. Comfort hiking boots. These are diabetic boots. The wikipedia page on this topic shows striking resemblance with everything you’ve just told me. I know, I know… you’re not diabetic. But still… they are designed with foot health in mind. They are wide, although not 4-6E wide. Could be that they’ll give you enough comfort that you won’t have to suffer so much anymore. I’ve just started working at a hospital where I have to walk a good bit. I’m am extremely overweight and am not used to any activity, especially walking a lot. I have to wear dress clothes (pants) so I need a good looking shoe that will help with my back and knee pain. Any suggestions? I just found your site and really love all the information you have available. I’m an overweight middle aged-woman who took up running a few years ago. The best shoe I found was the Mizuno Elixir 7, which isn’t made anymore. I bought several pairs online but now, since I’ve gained even more weight, nothing is comfortable. I was told a few years ago that my feet were pretty normal and to stick with shoes that don’t flex or bend in half in the middle. I am trying to lose weight by running/walking. Can you recommend a few shoes that might help me? Mizuno shoes are fantastic. I know this from experience, because I’ve bought a pair of those myself since last updating this page. I should really put Mizuno on here as well! To answer your question… If you’re trying to lose weight, then you must first decide exactly how you are going to do it. Are you going to do it by walking, or by running? Or walking first, and running later on? The more overweight you are, the easier it is to shed pounds with low intensity physical exercise, ergo ‘walking’. So if you decide you’re going to walk the pounds off, you might choose to go for footwear other than running shoes. Take nursing shoes, for example. These are made for standing up comfortable all day. If you absolutely have to have shoes for jogging and you liked Mizuno in the past… then I recommend that you stick with Mizuno. I am 67, 200 lbs and need knee replacement, but I am not ready for surgery. In the meantime I need a cushioned shoe for just everyday walking. I do no run, but all the shoes are running shoes. What do you recommend? I have just published a page that lists all of the best women’s lightweight walking shoes. A total of 80, 40 of which for women! Do you think you can find something in there? Of course I am overweight otherwise I would not have found this site based on my search. In April I will be going to Israel and need a good walking shoe. Also I have planters fasciitis. 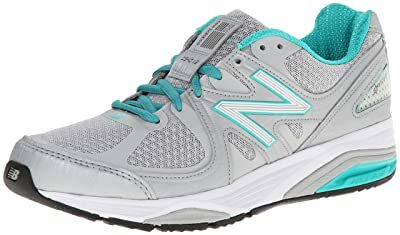 I liked New Balance and Sketchers because other shoes listed had wild colors and I need like black, grey, white type of colors. Can you please recommend a brand? I think you’ve already recommended two brands! And as luck would have it, I have just updated my page that reviews lightweight walking shoes with 80 new reviews, of which 40 for men, but also 40 for women! There are plenty of Skechers and New Balances in there. And also in the colors you prefer! Think you’ll be able to find something useful in there? I just started a job that requires a minimum of 10k steps a day. I walk a ton! Here’s the thing. All of my shoes (Sketchers, puma, NB, Socony(sp)) give my 4/5 toes blisters. I also had 2 surgeries on my ankle tendons so need the ankle support as well as the arch support due to planters. Any suggestions for me? I read through all of these and am not sure what I should start looking at first. I am overweight, Hence me finding this page. ???? A knowledgable person recently tipped me about the Saucony Redeemer being a really good one for overweight people! Read the reviews on Amazon and tell me what you think! great article and really appreciate the recommendations. I am a nurse of 25 years, overweight and don’t have the option of a sit down job. so I am always on the look for the best shoe possible. my last purchase were Brooks and they were def a great choice. I also think one problem when people buy shoes is what they anticipate the life expectancy of a shoe. my Brooks have done wonderfully for 4 months but I know it time to purchase a new pair because knee and back pain are creeping back. they still look wonderful but I can tell the soles have worn down by the change in support. I tend to buy new work shoes every 3 to 6 months. 8 to 12 hour shifts, 5 days a week take a tole on shoes. I think I am going to stick with Brooks for a while. they are pricey but as the saying goes “you get what you pay for”. Thanks for your feedback. Good on you for taking such good care of your feet. Having to stand up all day when being overweight is really hard! I encourage you to do something about your weight, because it’ll be easier on your feet. Be glad your standing up most of the time. Getting a sitting job, would only exacerbate the situation! I used to be overweight myself. I know how hard it is. I’d be willing to help you lose weight if you’d be interested. Email me using my contact form if you are. Thank you for such a great article. I, too, like others battle being overweight as a result of steroids for my Lupus and Fibromyalgia. I experience stress fractures very often on the tops of my feet and severe OA in my lower back due to bone loss and yet, I’m in a position where I’m walking 100% at work. Once home with the ability to finally sit; I start to cramp horribly in my lower legs. I was wondering what shoe you might recommend to help alleviate the pain? Thank you in advance for your time and help. You may be interested in a nursing shoe instead. Many of these shoes are clog like footwear, which will give you plenty of room. It might help against the cramp at the end of the day. I also have two pages up on standing shoes. You can find one here, and the other here. It will also help to have really good insoles. My personal favorites are Tread Labs! I do have a nursing shoe page up on my site, but that page lists cloglike shoes, not tennis shoes like you request. Is there anything in there you like? I’m in training for a 60km walk which will take us over soft sand, bush trails and some roads. Being around 100kilos and having a inroll on both feet I’m looking for boots and shoes that will get me through with the least amount of damage and the most amount of comfort! Can you please give me your suggestion in hiking boots for these conditions please? Also what would you suggest for a runner for the second half? If it’s women’s hiking boots you need, then you’re in luck because I have a huge page dedicated to them up on my site! Asics are really good. As are Mizunos. Like Asics, Mizuno hardly requires any breaking in at all. If you prefer to use your Asics, which are broken in, then by all means… do so. I’m not sure exactly how broken in they are, but always check the outer soles on a regular basis. If there’s not enough left, you’ll need new ones. I am very overweight, but losing it all over time. 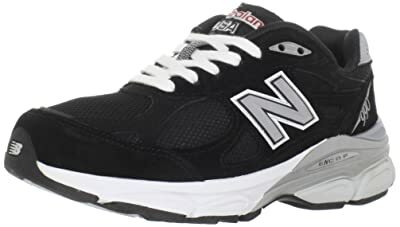 After a hip replacement, I started wearing New Balance 1540v1 in a 12E, but wear anything from a 10.5 to 12 in C, D or E. About 3 months ago, I started havin severe nerve pain in the top of my foot into my big toe on one foot. (I have high arches and the dr. says the dorsal nerve has been irritated and should not have pressure on it. This makes wearing normal walking shoes impossible. Is there a good shoe for walking (just on bike trails, tracks, sidewalks – not cross-country) that will support my ankles with stable heel design and not come up onto my arch? I’ve tried skechers good walk, but they are still too high on the top of the foot. Help? Sorry to hear you are having so many issues currently! It sounds to me like you need roomy shoes. You are also saying you need ankle support. What instantly springs to mind is this pair of Dr. Comfort hiking boots. They are for diabetics, who often experience feet trouble and are in need of optimal comfort. Do you think this would be a good match for you? I’m going to new York City next week and have been trying to walk a 5k every day to prepare for it. I love to walk but the Nike shoes I have always bought hurt my feet, my arch, my back, just everywhere. I’m over weight and as I get older I’m walking less and less because of the hurt I have after. Which is resulting in more weight gain. I didn’t even think that my shoes could be the problem. What do you recommend for me that I can purchase fast and break in in time? Thanks! For you, I recommend the Mizuno Wave Creation. Mizuno gives so much support, it’s not even funny anymore. Especially if you complement them with insoles from Tread Labs. Can you tell me what you know about Hoka Bonti Uno Uno? Someone recommended I look into these. I’ve been wearing Brooks Addiction for the last 7 years and have found them to be okay, but still seem to have some issues. I had surgery in 2007/2008 on both feet to remove an extended metatarsal at the second toe in each foot. This seems to have made matters worse, because it seems to have changed the dynamics of each foot. Also I tend to roll my foot out, that is until I get to the heel area, I also seem to be leaning in. I am overweight due to spousal disability and my non movement. I am getting ready to take an extended trip and will be doing a lot of walking, what I’m looking for is a shoe with great support, comfort, can hold an orthotic while still having comfort. Any suggestions would be greatly appreciated. Thank you. Sorry to hear about all your foot problems! I had never heard of Hoka One Bondis myself, but I found them on Amazon. I’ve never worn them myself, but judging by their specifications and their rave reviews, I would have no reservations in trying them out. They look like really decent sneakers to me, and I know a thing or two about footwear. Mind you, from reading the reviews it looks to me like these Hoka Ones come with a non-removable footbed, which means they’re not suitable to hold an orthotic! There are plenty of shoes with removable insoles on this list. But if you want a personal recommendation that’s not on here, then I’d say have a look at the Mizuno Wave Rider 20s. I’ve been wearing Mizuno for a while myself now. Excellent support and shock absorption. The insoles on these Wave Riders are removable, so it should be right up your alley! Let me know if this helps, Valerie. Looking for new shoes. My favorites to date have been Nike Air running shoes (although I walk rather than run). They are very lightweight and comfortable and fit perfectly. I wear a 9 medium. Don’t need extra-wide. My only problem with the Nikes is that in a relatively short time my toenails cut right through the mesh fabric, no matter how short I trim them. I guess my toes turn up on the ends! What’s an attractive light-weight walking/running shoe for slight overpronation that doesn’t have mesh fabric at the toes? I’d go for either one of the Skechers, or the Brooks Addiction walker! Sorry to hear about your foot, knee and leg problems. It would help to lose weight, as it would lessen the pressure you exert on your own feet. Besides from that, you could probably do with good arch support insoles. I wear and recommend Tread Labs myself. My new favorite shoes are Mizuno sneakers. They give you extremely good support out of the box. In combination with the Tread Labs, they’re golden! What would be the best shoe for someone who is overweight and oversupinates? I also have heel pain after being on my feet a while. Try the Brooks Ghost 9. They have supination support. It can also help to supplement your new shoes with good insoles. I recommend Tread Labs. But before you buy, contact them to learn if their insoles are suitable for supinators! I’m a mess and really need to find new shoes soon. I’m overweight, with high arches and wide feet. Recently starting working 8+ hour days, 5 days/week and every night I’m in agony with lower back pain, sciatica and of course, sore lower legs and feet. I feel like I’m asking for a miracle, but I’m desperate. What kind of job is it and what kind of shoes are you looking for? I work in a pharmacy, so I’m walking all over, about 7000 steps according to my fitbit in 8 hour period. I’m open to any shoe type i think, maybe a good walking shoe. Yeah, you could really use a good pair. If you don’t like sneakers, then maybe you could go with a nursing shoe? I’m 40 yr woman and severely obese with associated problems (such as: knee, leg, back and foot pain). Both legs have severe lymphedema, along with leaning outward from the knee to ankle (think of an upside down Y when standing). After many tries I could never find the right shoe or insole to help with any of it. I recent found out that I have underpronation/supination. After a many hours of researching online and found this page. Thank God! Lol. My feet are small, size 8, medium to high arch but the toe area needs width due to toe deformaties. Any suggestions would be appreciated!!! Due to the fact that you need extra room in your shoes, it would possibly be a good idea to go with diabetic shoes. Diabetic shoes are roomy and non-binding. It’s quality footwear that will give you good support as well. I am VERY DISTRAUGHT! I know some people may have had problems with the Ladies’ Skechers Shape-Ups, but I REALLY NEED the arch support they offer. I have weak ankles, and even I benefitted from them. Sorry to rant, but I’m running out of options. Sorry to hear you’re so stressed out. Anything I can do to help you? How about just going on a diet and exercising by rolling around in bed? Keep it simple! Have you tried that out? What results did you get? I just checked and for me only 2 out of 25 shoes reviewed weren’t available. I’m sorry to hear you couldn’t find a good shoe your first time around. Maybe give this page a second chance? Thanks for this research it is very helpful. The question I have is on the Asics Women’s Gel – Nimbus 17. I am having a tough time finding this shoe in my size. What is the difference between this one and the Nimbus 20? Would any Nimbus work? Shoe manufacturers are constantly bringing out new and improved versions of their shoes. Running shoe manufacturers are especially rockstars at this. Ofcourse they want you to believe that every newer model is better than the previous one. The reality is that there are as many different kinds of feet as there are people. So whether you’ll prefer the Nimbus 17 over the Nimbus 20, or vice versa, will completely depend on your subjective experience of them. I just checked for you… at the moment, the Nimbus 17 gets more and higher reviews than the Nimbus 20. If you can’t get the Nimbus 17 in your size, then I recommend you browse around for another Nimbus that gets rave reviews just like the Nimbus 17. You gave way to high a score on the Loving Life Memory Foam ones. I bought a pair as a plus size walker who saw they were highly recommended on many reviews. NO ARCH SUPPORT, NO ANKLE SUPPORT, they get loose around ankles and heel too quick. I’m 5’8″ and 258 (i’ve gone down 10 pounds!) but left foot is 9.5 US womens and the other fits better in a 10 US womens size. so usually buying a 10 is okay, but this one pair of shoes is a bit crap after only 2 weeks. I slipped in restaurant bathrooms at least twice, I can’t walk when it’s even remotely rained in the past few hours (good luck now, Florida rain season..), and they fit horribly. And you can’t return shoes you’ve used to 2 weeks. Actually have people of all shapes, sizes and shoe problems try the products before giving it a high review. I would give these a 3 on a good day if the ankle area wasn’t loose. Experiences will vary from one person to the next. I welcome your criticism and appreciate that you took the time to leave your review. I update my content frequently and make notes of shoes that my readers comment negatively on. It will likely be replaced with another shoe review at some point in the future. Thanks again and I hope you’ll find a good shoe for yourself! Hi Brian, wow! Thank you for this website and your being so responsive to commenters. I’ve been wearing NB W860WB4 in size 9 1/2 D for a few years. They don’t make them anymore but I’ve been able to scrounge up new pairs on amazon or ebay. In addition to my weight, I have a bit of high blood pressure, some depression, and am a HORRIBLE sleeper. I know that exercise can help with all of those problems so I *try* to get in 5000 steps or more. My issue in recent months has been that if I walk even one mile, my feet wind up really hurting (I think my right one in particular). Just a sort of generalized pain, maybe some would describe it as arch pain? I don’t know. I don’t have any back pain or any other pain at all. It’s hard for me to gauge whether my feet are getting worse, or is this maybe not the right shoe for me? I haven’t gained weight recently so it’s not unusual or different stress on my feet, I don’t think. I am taking my 9 yr old son to Orlando to go to Harry Potter World down there in about 7 weeks and I would like to address this as much as I can before we go. PS about 12 or 13 yr ago I was given some orthotics after walking/running caused some foot pain. I remember them being highly uncomfortable and so I couldn’t wear them much. Hard plastic!! Thanks for your kind words. I really do appreciate the compliment. I am currently processing a backlog of comments and by the looks of it I am replying to your comment too late, as you’ve already done your Harry Potter World tour. I apologize for that. I’ve been overweight myself and also cope with sleeping problems from time to time. I can tell you from experiences that losing weight will help you stand on your feet more comfortably and that going to bed at the same time each evening will help you sleep better. I’ve picked 23:00 myself and I stick to it religiously. If your foot pain continues, it’s best if you go see a doctor about it. I have no medical degree and can’t dispense medical advice. When it comes to finding the best footwear solution for you… I currently wear and recommend the Brooks GTS 18. They are extremely comfortable and I am loving them so far. As for arch support… my favorite insoles also happen to be hard plastic ones: Tread Labs. I do not experience them to be ‘hard’, however. But everybody’s feet are different and I can’t speak for you, ofcourse. However, if you are more into softer arch support, then I’ve also got a hands-on review of Soul Insoles. These are a soft gel that conform to your feet, yet never get bent out of shape. That is a nice site you got here. Good job! I am severely obese, with wide (and often swollen) feet and I am diabetic. I am trying to find something to wear at home like slippers, sandals or flip flops since I work at home and wearing shoes inside the apartment well it is not an option. So far the only thing that doesn’t hurt are Havaianas classic flip flops, I guess because of the rubber. They usually hold 3 or 4 months till I need to replace them. Sometimes I also wear flip flops with a kind of foam material but they soon also get flattened by my weight. Anyway I know that wearing flat flip flops all the time it is not good for the feet or the back. Do you have anything to suggest? it must be really well cushioned, very soft (I cannot wear for example the clogs you suggest above, too hard). I have a page up on diabetic footwear and there just so happens to be a flip flop and some slippers in there that I think you’ll like. Let me know if that helps. Best of luck with your situation! I need help in finding a good pair of open toe with out straps in the back sandals for my mother, she is 85 years old and overweight, shoes are not much of a problem since I put them on for her but I am looking for a pair of sandals that she can just slip on with out help, the problem is that the top part of her foot is fat and wont go trough the straps of most shoes, the sandal also has to have a 1 to 1 1/2 inch heel if not she feels like she is falling backward. I have bought sandals that are extra wide and the strap are still too narrow, any suggestion is appreciated. I have some suggestions that might be useful for your mother. I have a page up with reviews of regular flip flops. There is a flip flop on there called the FitFlop Lulu. It looks to me like it’s got a fairly thick heel as well as a roomy strap. Since the comfort and support requirements are pretty high, you may want to consider choosing a sandal from either my hiking sandal reviews or my water shoe reviews pages. I just scrolled through those last 2 links and I’ve spotted a few sandals with thick inches and wide straps. I just want to let you know I appreciate you! Recently, I have gained over 100lbs from being on steroids for RA, as well as found to have spinal stenosis in my lumbar and cervical spine. (I hit my mid 40s and fell apart-lol.) I’ve always been heavy, but tipping the scales at now 300lbs, combined with the health issues have made starting an exercise program to get the weight off challenging and painful. I know finding the right shoe will help. Will alleviate some of that. Your research helped in the shoes that I will try so very much! Thank you! Again, I appreciate you so very much! I am glad to hear that you have found Boot Bomb’s research to be of value. All the best to you. And please tell your friends! I had a stroke in December 2016 and am finally to cane but I have bad balance issues sometimes, overweight, and I have physical therapy. I have Venus insufficiency and especially on the left my foot and ankle swell terribly all the time, everyday. I have gotten mixed reviews as to what shoes to get to help and criticism for just wearing whatever is comfortable to me in a pinch. Any thoughts? Thanks in advance and keep up the good work! Thanks for the compliment. But why on earth would a helping person be hateful to the person requesting help? People like that ought to be thrown into a river. Sorry to hear about your health problems. But fear not, because I think I have something for you that might help. By the sound of it, you could potentially do well by going for diabetic shoes, to which I just so have happened to dedicate an entire review page. Diabetic shoes were made with problem feet in mind. They are non binding, meaning they leave your feet lots of wiggle room. This could definitely help keep your pain in check.